Crowns - Dr. Isaac Comfortes, D.D.S. Dr. Isaac Comfortes will design your custom crowns in meticulous detail. He offers a full range of restorative materials, including tooth-colored porcelain and zirconia, and the most durable of all—gold. Gold is a frequent choice of patients who want the longest lasting restoration possible for a back molar that does not show when they smile. For porcelain crowns, he offers only the best materials for lifelike, natural appearance. His expert dental ceramist can see you in our office to make sure your custom porcelain crowns color match and perfectly blend with your smile. Dr. Comfortes will explain all of the restorative materials to choose from, their relative durability, aesthetics, and cost. He will encourage you to participate in the planning process so that you receive a crown that meets your long-lasting cosmetic, as well as functional goals. Why choose custom porcelain, zirconia, or gold crowns? Instead of offering a Cerec CAD/CAM milled crown that can be made and placed in your mouth on the same day your tooth is prepped to receive a crown, Dr. Comfortes wants the most perfectly fit and formed crown to enhance your smile. He and his ceramist will make an exact fit, shape the tooth for best appearance and occlusion, and in the case of tooth-colored porcelain crowns, perfect the translucence, reflectivity, and color of the crown to match your natural teeth. While your wait a couple of weeks for your crown to be made, you will wear a provisional crown made of durable, tooth-colored acrylic. Dr. Comfortes will provide the guidance you need. How will your tooth be crowned? After planning your procedure and helping you select the right type of restoration, Dr. Comfortes will likely place your crown in two appointments. At your first crown treatment appointment, he will reshape your tooth, removing any decayed or damaged material. This process will also create room for the crown so that it will lie flat against your tooth and maintain the natural force of your bite. Dr. Comfortes will numb your tooth and surrounding soft tissue with local anesthesia. After reshaping your tooth, impressions will be made of your mouth. Upper and lower molds of your mouth will be made from the impressions. He will use these molds to make a wax-up model of the restored tooth and check the biting contacts with other teeth. From this model, he can quickly create a temporary restoration while you wait. He will place this provisional crown on the prepared tooth so you can smile and eat with relative ease. Between this first appointment and your second one, Dr. Comfortes and his Certified Dental Technician (CDT) will use these records and Dr. Comfortes’s design to fabricate a restoration that functions and feels like a natural tooth. The natural appearance of a tooth-colored crown will be perfected to match your smile. 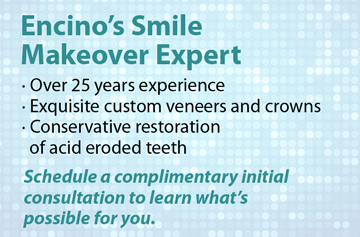 At your second appointment, Dr. Comfortes will remove the temporary crown and attach the permanent restoration. Before you leave the office, he will ensure that the crown does not disrupt your natural bite alignment. He will also make sure that you are happy with the look of your new tooth. He can make slight modifications to your crown in both form and color before you leave the office. If you experience a change in your bite or soreness in the days after your crown is placed, you should call us to discuss these observations. 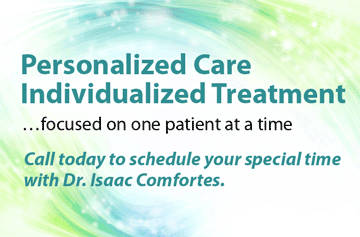 Dr. Comfortes will be happy to examine you sooner than your next scheduled appointment and make any needed adjustments. Implant-retained crowns are the gold standard in single tooth replacement. As mentioned above, a crown will typically go right on top of a damaged tooth. However, a crown can go on a dental implant to replace a missing tooth. If you are a candidate for an implant, Dr. Comfortes will have an exceptional, local dental specialist surgically place the implant in your bone to replace the missing tooth’s root(s). Over the next four to six months, your bone and gum tissues will heal around it. When you have fully healed, Dr. Comfortes will attach a permanent dental crown. Like traditional tooth-supported crowns, your restoration will match the shape and color of your natural teeth. Implants are permanent, and they will never slip out of place. They are also the only type of dental restoration that can prevent bone resorption. 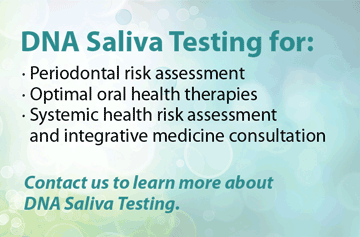 Take the first steps towards a healthy, renewed smile. Contact our office if you are looking for a dentist who cares deeply about the quality of his work and for the patients he serves. 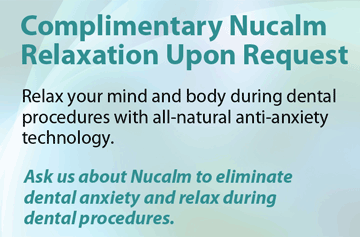 If you have had a root canal and need a crown…if you have a painful tooth…if you are concerned about the condition of your teeth and want to restore your smile…if you have delayed recommended treatment due to dental anxiety, you can be a patient of one of LA’s finest general and cosmetic dentists. Give Total Health Dentistry of Encino a call today – (818) 990-9101.